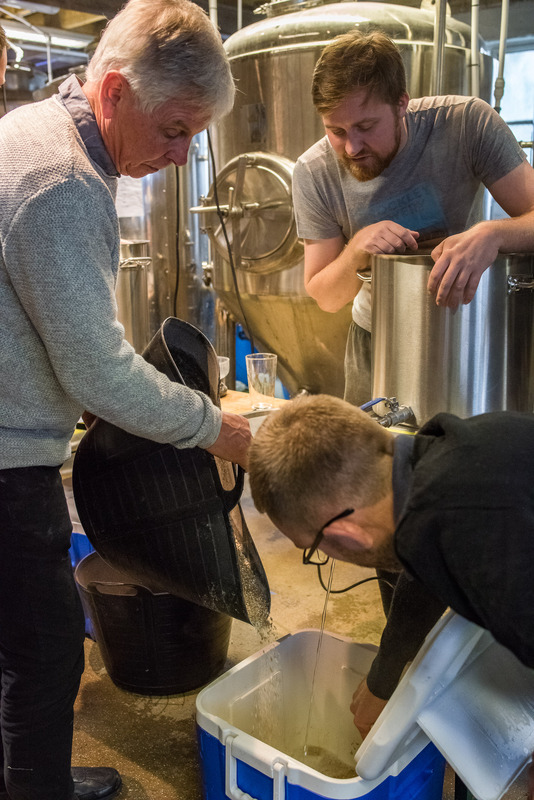 As the name suggests this was an action shot of the brew school as the brewers performed the ‘mashing in’ stage of the brew. I knew from photographing at the brewery that the mashing in was quite an obvious situation an action shot could occur at the brewery and so when I learnt the participants at the brew school would be doing this at a much smaller scale that day I tried to capture a decisive moment of their mashing in. I felt I was successful at this because it showed two of the brew school participants doing the mashing in as well as brewer running the brew school overlooking. Compositionally I thought the photograph was strong too because of an implied triangle between the three people pointing downwards towards where the mashing in was taking place. In my opinion it gave a better inclination to the viewer that there was a brew school happening at the brewery compared to Photograph 6. This photograph also served as a nice precursor and link to the next two photographs where the real mashing in for the brewery took place on a much larger scale. f/4.5, 1/200s, ISO 5000, focal length 35mm, handheld.